The 2018 Seahawks weren’t supposed to be good. But despite a season without longtime standouts like Richard Sherman, Kam Chancellor, or, for the last eight games, Earl Thomas, this year’s team controls its own destiny on the road to the playoffs. Seattle shed contracts and talent as the franchise worked toward a rebuild, dismantling its vaunted Legion of Boom defense in the process. In one offseason, the Seahawks dealt defensive end Michael Bennett to the Philadelphia Eagles for a pair of draft picks. Sherman was released to save $11 million in cap space, opting to defect to the 49ers as a newfound free agent. Jeremy Lane was also served his walking papers. Cornerback DeShawn Shead went from playoff game starter in Seattle to a rotational player in Detroit. Chancellor had a potential Hall of Fame career cut short by a neck injury. Cliff Avril suffered the same fate. Thomas begged for a trade and then broke his leg after 3.5 games of All-Pro playmaking. Mychal Kendricks, brought in as a last-gasp effort to shore up that defense, wound up suspended for half the season due to insider trading. These are not the moves of a team destined for a playoff spot. And yet the Seahawks are 7-5 with an excellent opportunity to earn an NFC Wild Card bid for their sixth postseason appearance in seven years. How is that possible? It all starts with Russell Wilson. Wilson is a two-time NFC champion, a one-time Super Bowl champion, and the starting quarterback of one of the most successful franchises of the 2010s. And somehow, he may be the league’s most underappreciated performer. He didn’t even show up on the MVP odds sheet after Week 13 despite throwing 29 touchdown passes in 12 games and leading his team into postseason contention. His latest performance suggests he’s peaking at the perfect time for a surging Seahawks squad. Wilson absolutely roasted the 49ers, putting last Sunday’s game out of reach before halftime. It only took him six passes to throw his first three touchdowns, and a fourth pushed his TD:INT ratio this season to a tremendous 29:5. While he’s not as prolific as the quarterbacks getting the shortest odds for the league’s top regular season honor, he’s been devastatingly efficient. He needed only 17 passes to lead a 43-16 blowout win over the Niners. He also needed just 17 attempts to throw for 248 yards and three touchdowns while recording a perfect 158.3 passer rating in a 28-14 Week 8 win against the Lions. In his last four games — three wins and a five-point loss to the Rams — he’s thrown 11 touchdown passes and zero interceptions while running for another 127 yards. What’s more impressive is that he’s doing it without many of the wide receivers he’d relied on in the past. Jermaine Kearse was traded to the Jets in 2017. Jimmy Graham and Paul Richardson both left the team in free agency last offseason. Doug Baldwin has missed a pair of games and has been slowed by a knee and hip injuries en route to what may be his least productive season since 2013. That hasn’t mattered, as Wilson has turned Tyler Lockett, David Moore, and Jaron Brown — 19 receiving touchdowns between them — into bonafide scoring threats. Wilson’s had great, if underrated, years in the past. In 2015 he led the league with a 110.1 passer rating. Last fall his 34 touchdown passes were more than any other quarterback. But in 2018, despite an offensive line that’s allowed him to get sacked on more than 10 percent of his dropbacks, he’s on pace to eclipse both those marks (39 TD passes, 115.5 rating). Any chance Seattle has at greatness begins with Wilson’s quietly spectacular 2018. Wilson’s been a beneficiary of a rising tide of quarterback play across the NFL, but the biggest factor that’s helped him unlock a new gear in 2018 has been one of the league’s most potent running games. Chris Carson’s emergence as a legitimate starting tailback has solved the playmaking gridlock that had gripped every non-Wilson member of the roster last season. Wilson either threw for or rushed for 37 of the team’s 38 touchdowns in 2017. This year, all of Wilson’s touchdowns have come through the air. Carson, Mike Davis, and first-round pick Rashaad Penny have contributed for nine more. That’s not a ton of diversity, but it’s enough to keep opponents from disregarding the run and focusing solely on stopping Wilson. Here’s how the team’s rushing offense has improved through 13 weeks of the 2018 season. Carson has been the biggest factor in that newfound strength. The 2017 seventh-round pick has a chance to give the club its first 1,000-yard rusher since Lynch in 2014 — he only needs to average 74 rushing yards per game over the last quarter of the season to get there. While he’s not yet pushed his way into the circle of trust, his relative consistency has been an asset for Seattle. He’s recorded 50+ rushing yards in eight of his 10 games this season. Last year, the Seahawks only had four games where one of their running backs could claim the same. That added rushing proficiency has cleared the space for Wilson to find targets downfield. Carson’s threat out of the backfield has forced opposing safeties and linebackers a few steps closer to the line of scrimmage and created opportunities in the middle of the field. Wilson’s completion rate has risen from 61.3 percent to 66.6 between 2017 and 2018. After averaging a career low 7.2 yards per pass, he’s rebounded to 8.3 this fall. The Legion of Boom is dead, and the days of Seattle fielding a top-five defense are far in the franchise’s rear view. But while this 2018 team is a far cry from its star-studded past, the Seahawks have woven together a cohesive unit that can give Wilson enough space to win games. 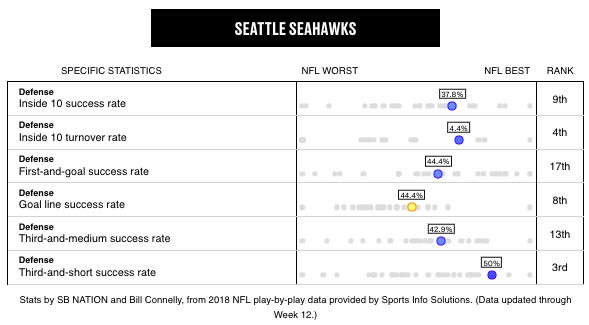 Here’s the thing: the Seahawks suuuuuuuck early in drives. Teams rip off wide swaths of yardage on first and second down to create a ton of scoring opportunities when they face Seattle. But when it comes to getting stops, particularly in short yardage situations, the Seahawks transform into a significantly stronger unit. It’s how the team ranks 19th in the league in yards allowed but ninth in points allowed (also, the consistent excellence of rookie punter Michael Dickson, whose pinpoint accuracy has forced opponents to start drives deep into their own territory). Bobby Wagner, one of the few holdovers remaining from the Legion of Boom days, has been exceptional at middle linebacker. Frank Clark has already matched his career high with 10 sacks. Jarran Reed has brought a valuable pass-rushing presence from the middle of the defensive line. Bradley McDougald has been an effective two-way safety behind them. The rest of the depth chart needs work, which was expected after this spring’s purge. A handful of young players with big aspirations have struggled with additional responsibilities, but guys like Tre Flowers and Shaquill Griffin are showing off flashes of talent that could serve as a foundation for useful careers. Even with a few middling performances, that group is outperforming expectations. And with Wilson playing at the level he has, they can afford a few lapses as long as they keep snapping back into form when their team needs them the most. The Seahawks weren’t supposed to be sniffing around the postseason race come Week 14, let alone in position to steal a bid. Most preseason prognostications slotted them in toward the bottom of the NFC as they dealt with massive personnel turnover. Instead, Wilson’s tremendously efficient play behind center has risen to a new level thanks to the ground support of Chris Carson. A better-than-expected defense still has plenty of weaknesses, but its killer instinct didn’t depart when Sherman, Chancellor, Bennett, and Avril did. Seattle is getting important stops in clutch moments and that has not only improved its playoff hopes, but it has knocked teams like the Packers and Panthers from playoff contention. While the team’s resume still needs work — the only current playoff contender they’ve beaten was a then-disheveled Dallas team — there’s enough talent seeping through Seattle’s quasi-rebuild to make the club a threat to anyone in the league. The Seahawks are more than just the reason why fans of other franchises need a drink, though. Wilson’s dual-threat playmaking is built for the tight margins of the postseason, and while his defense may yet be the fatal flaw that keeps Seattle from the Super Bowl, the team’s built for a hell of a ride along the way.